I did not spend much time last night painting but rather I was researching colours and catching up on some reading (after ducking between rain drops here and there on the way to get dinner then get home). 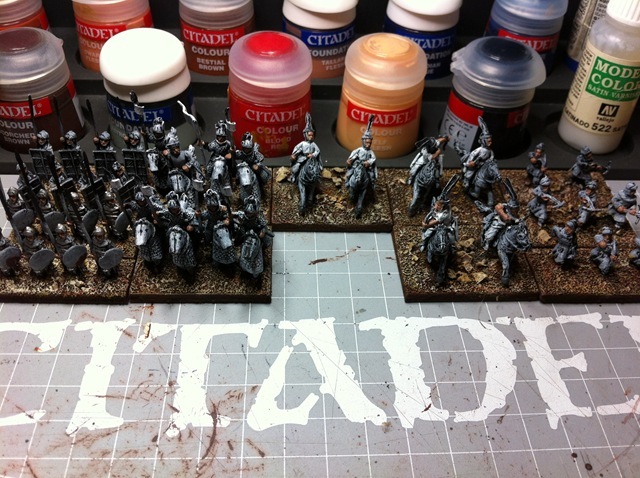 I did get some more paint on the figures though (although you’d probably not notice from the picture to the right). A couple of close-ups may help here. I also did a base colour for the flesh on the figures. I am trying to get three shades on a 15mm face so started with a flesh foundation colour. Tonight I will give the flesh a brown wash then a dry-brush with a light flesh colour and let’s see how that looks. For the heavy infantry here I also painted the armour. 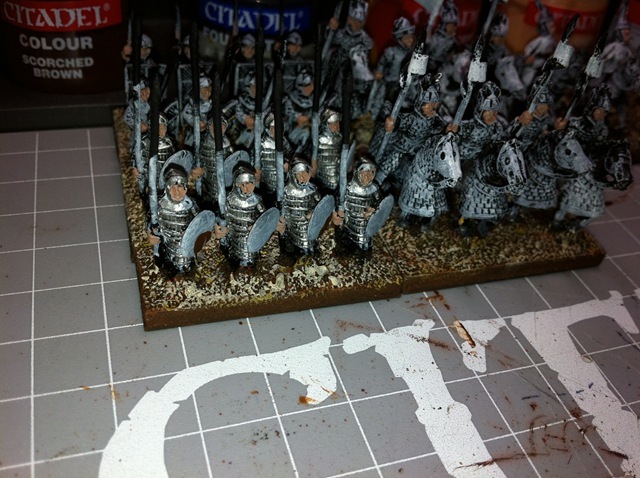 This was painted with a chainmail colour which looks a bit steely. It will be washed with black ink tonight which should darken it a little and pick out the detail. The last colour added last night was some white. 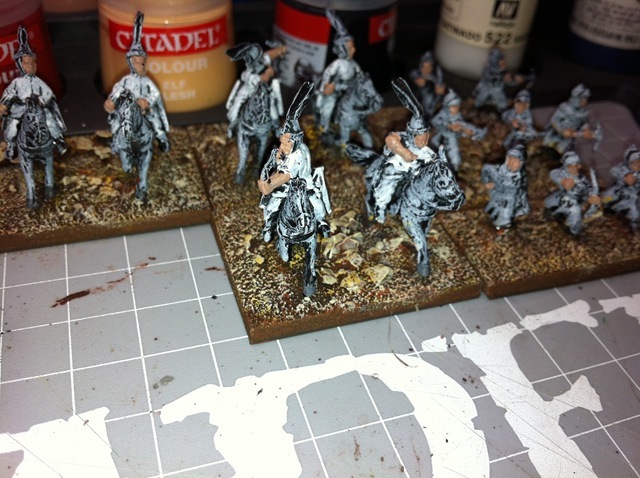 I did the uniforms on the Light Horse with a white coat of paint. Again, tonight, I will maybe wash the white areas with a dark grey wash and then a final white dry-brush to take care of the major part of the uniform. I’ll then add some colourful borders to the figures so give them a little more pizzazz. I am thinking that nice Korean blue will work well and give the figures the appropriate appearance. The next instalment will be tomorrow where we are able to start to see some of the figures approaching completion. I think the Heavy Cavalry is in for some work tonight! starting to look the part mate.